Palo Verde and Coronado’s girls golf teams braved the windy conditions Monday afternoon to take leads in the Class 4A Sunset and Sunrise Region tournaments at Boulder City Municipal. While most saw the 15-20 mph winds as a hindrance Monday afternoon, Palo Verde girls golf coach Todd Steffenhagen thought his veteran-led team could use it to their advantage. And to a certain extent, he was right. It also helped having the day’s top overall performer. Annick Haczkiewicz was one of only two golfers from the two Class 4A regions to shoot under par at the 5,566-yard Boulder City Municipal course, and it was the senior’s big day that helped the Panthers grab a one-stroke lead over Centennial after the first day of the Sunset Region tournament. Haczkiewicz shot 4-under-par 68 to lead all golfers, and teammate Rebecca Oertel carded a 76 to move into fourth place and help the Panthers end their day at 326. Favored Centennial is second at 327, ahead of Bishop Gorman (342) and Clark (362). The two-day tournament concludes Tuesday at Bear’s Best. Haczkiewicz finished with six birdies and made the turn at 3-under to get the Panthers off to a strong start. Along with Clark freshman Riana Mission (69), Haczkiewicz — who is committed to Brigham Young — was able to control her distance shots and find success in her short game. It did for everyone else. Gorman’s Hunter Pate ended the day in third (75). Faith Lutheran’s Sydney Smith and Hall are tied in fifth at 77. In the Class 4A Sunrise Region, Coronado had four of the top five golfers to take a commanding lead. The three-time defending region champions shot 317, and currently have a 93-shot advantage over second-place Green Valley. Coronado coach Joe Sawaia said he liked how his players handled the conditions, but hopes their putting is a little sharper Tuesday. “For the most part, it was just us handling the greens,” Sawaia said. “We didn’t putt very well today. That attributed to probably 10 strokes more than we needed to shoot. But we did what we had to do to come out and move on to the next day. Coronado senior Gabby DeNunzio, who has committed to Weber State, currently sits atop the Sunrise Region leaderboard at 3-over 75. 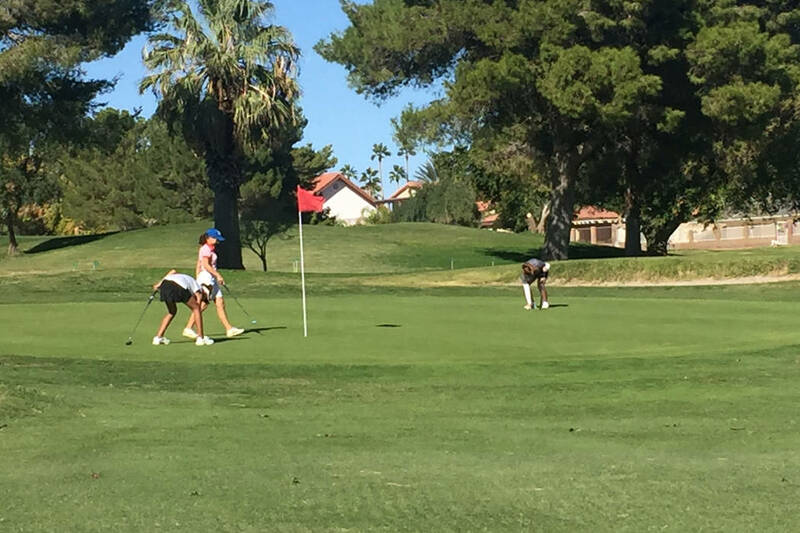 DeNunzio is ahead of Cougars teammates Victoria Estrada (78), Sami Penor (78) and Crystle Querol (86) and Foothill’s Katie Schlichenmayer (88). DeNunzio was even-par after hole No. 11, but bogeyed three of the last five holes, including 17 and 18, to come back to the field. She will be looking for her first region title on Tuesday. In the Class 3A Southern Region tournament, Boulder City’s Lani Potter shot 2-over 74 to help the Eagles take the opening-round lead at Las Vegas Municipal. The Eagles shot 357 as a team, 14 shots ahead of second-place Tech. Pahrump Valley is third at 382. Pahrump’s Breanne Nygaard is second individually at 80, and Tech’s Cassidy Phelan is third at 82.